Estuches de Model Air formulados después de un riguroso estudio y comprobado su tono exacto con la guía Federal Standard 595, RLM y British Standard Colours BS381C. Incluyen perfiles de aviones realizados por Mark Rolfe, en los cuales se indican los colores necesarios para pintar los esquemas de camuflajes y una descripción de los mismos. Con la colaboración de “Pieza a Pieza Modelling Workshop”. Con la colaboración de “Pieza a Pieza Modelling Workshop”. sobre la materia, así como una ardua búsqueda en la todavía hermética y errática información oficial disponible. descripción detallada de los mismos. Con la colaboración de “Pieza a Pieza Modelling Workshop”. Estuche de 8 colores Model Air de 17 ml. desarrollados para pintar aviones de la USAF empleados en el Sudeste Asiático durante la “Guerra de Vietnam”. Esquema de camuflaje elaborado para este teatro de operaciones conocido como “SEA” (South East Asia) y una variante de este empleado por los bombarderos del SAC (Strategic Air Command). Sierra Tan ANA 628 (FS 30219): Camouflage color scheme SEA, combined with Dark Green (FS 34079) and Medium Green (FS 34102) on upper surfaces of aircraft. Dark Green ANA 631 (FS 34079): Camouflage color scheme SEA, combined with Sierra Tan (FS 30219) and Medium Green (FS 34102) on upper surfaces. The same variant color scheme was also employed for the bombers of the SAC, combined with FS 34159 and FS 34201. Medium Green (FS 34102): Camouflage color scheme SEA, combined with Sierra Tan (FS 30219) and Dark Green (FS 34079) on upper surfaces of aircraft. Green (FS 34159): Variant of camouflage color scheme SEA, employed for SAC bombers combined with Dark Green (FS 34079) and Tan Green (FS 34201) on upper surfaces of aircraft. 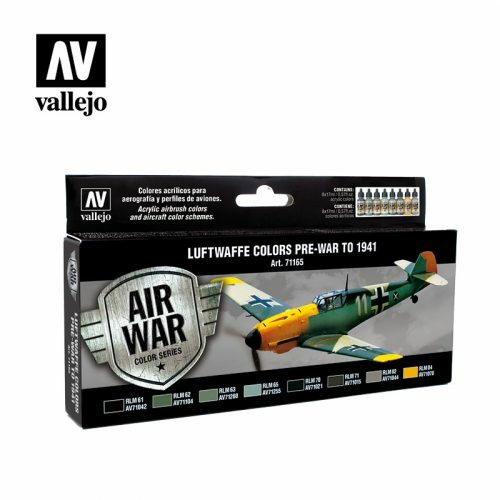 Tan Green (FS 34201): Variant of camouflage color scheme SEA, employed for SAC bombers, combined with Green (FS 34159) and Dark Green (FS 34079) on upper surfaces of aircraft. Camouflage Gray (FS 36622): Lower color for camo. scheme SEA, for all types of aircraft and daily operations. Flat Black ANA 604 (FS 37038): Lower color camouflage scheme SEA and its variants, for SAC bombers and all kinds of aircraft and night operations. Insignia White ANA 601 (FS 37875): Lower color, variant of camouflage scheme SEA for SAC bombers, daytime operations. Estuche de 8 colores Model Air de 17 ml. desarrollados para pintar aviones de la Israeli Air Force (IAF) empleados con posterioridad a la “Guerra de los Seis Días”, esquema conocido como “Desert Colors”, hasta los actuales esquemas grises de “Superioridad Aérea”. 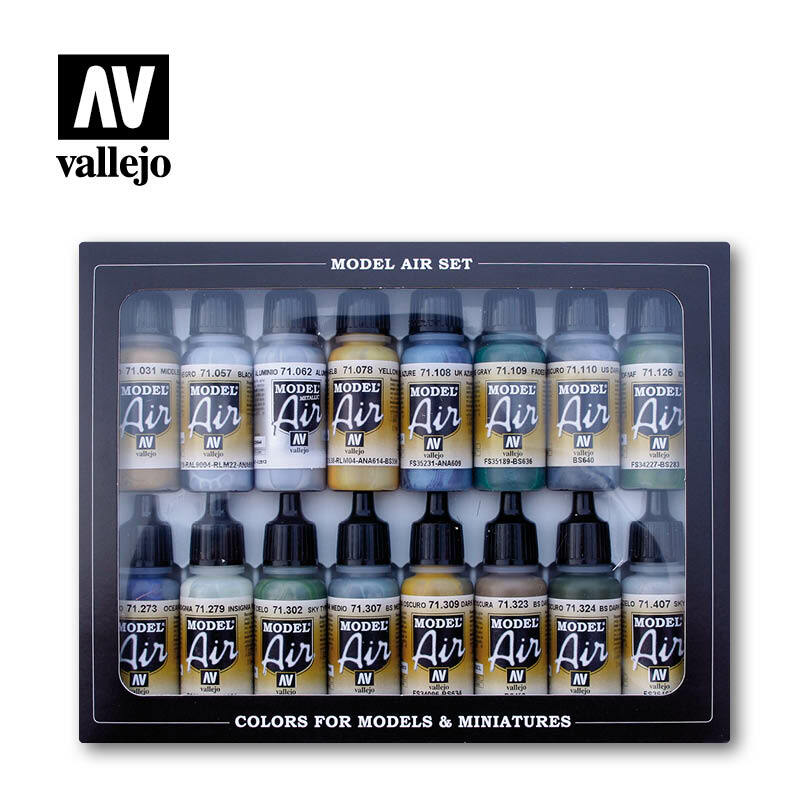 Estuche de 8 colores Model Air de 17 ml. desarrollados para pintar los esquemas de camuflaje de aviones soviéticos y sus distintas combinaciones de colores, desde 1943 hasta el final la “Gran Guerra Patriótica” en Mayo de 1.945 con la caída de Berlín y el final del Tercer Reich. AMT-1 Light Greyish Brown: Nitrocellulose laquer for upper part color scheme “Grey-Brown-Green” for airplanes of mixed fabric/wood and metal structure. Used starting 1943. A-21m Light Greyish Brown: Oil-based enamel, equivalent to the color AMT-1 but more yellow, used in upper color scheme “Grey/Brown/Green” and “Black/Brown/Green” for aircraft of metallic structure. AMT-4 Camouflage Green: Nitrocellulose lacquer, upper color scheme “Black/Green” for airplanes of mixed structure and metallic finish. A-24m Camouflage Green: Oil-based enamel, equivalent to the color AMT-4, superior color scheme “Grey/Brown/Green” and “Black/Brown/Green” for aircraft of metal structure. 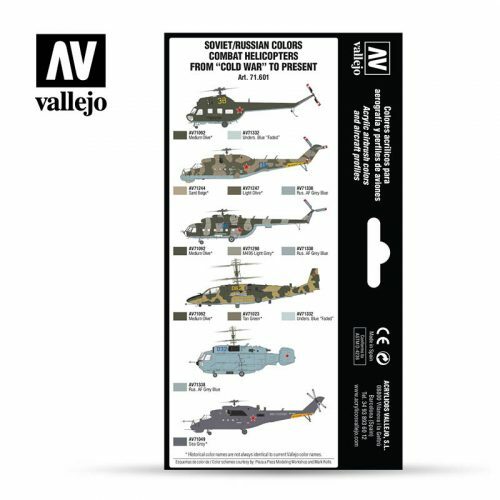 AMT-6 Matt Black: Nitrocellulose lacquer, upper color scheme “Black/Green” and “Black/Brown/Green” for aircraft of mixed structure and metallic finish, as well as for lower part of aircraft for night deployment. AMT-7 Greyish Blue: Nitrocellulose lacquer for lower surfaces of aircraft of metal and mixed structure. Introduced starting 1943 as a substitute for AII Sv.gol. AMT-11 Blue Grey: Nitrocellulose lacquer for upper surface scheme “Grey/Grey” for aircraft of mixed structure, principally fighters. Used starting 1943. AMT-12 Dark Grey: Nitrocellulose lacquer for upper scheme “Grey/Grey”(fighters) and “Grey/Brown/Green” for aircraft of mixed structure. Used starting 1943. Estuche de 8 colores Model Air de 17 ml. desarrollados para pintar los esquemas de camuflaje de aviones soviéticos y sus distintas combinaciones de colores, desde el comienzo de la “Gran Guerra Patriótica” en Junio de 1941 hasta el año 1943, punto de inflexión en el Frente del Este. AII Zashchitnyi Camouflage Green: Nitrocellulose lacquer for upper surface of aircraft with combined wood/fabric and eventually metal structures. Specifications issued in 1937 and used between 1938 and 1941. AMT-4 Camouflage Green: Nitrocellulose lacquer for upper surface color scheme “Black/Green” for aircraft of combined wood/metal structures and metallic finish. A-24m Camouflage Green: Oil-based enamel equivalent of the color AMT-4, upper surface color scheme “Grey/Brown/Green” and “Black/Brown Green” for airplanes with metal structures. AMT-6 Matt Black: Nitrocellulose lacquer for upper color scheme “Black/Green” used on aircraft of mixed structure and metal finish. AII Sv.gol. (Svetlo goluboi) Light Blue: Nitrocellulose lacquer for lower surface of aircraft with combined fabric/wood and eventually metal structure. Used widely in 1940-1942 and gradually replaced by AMT-7. 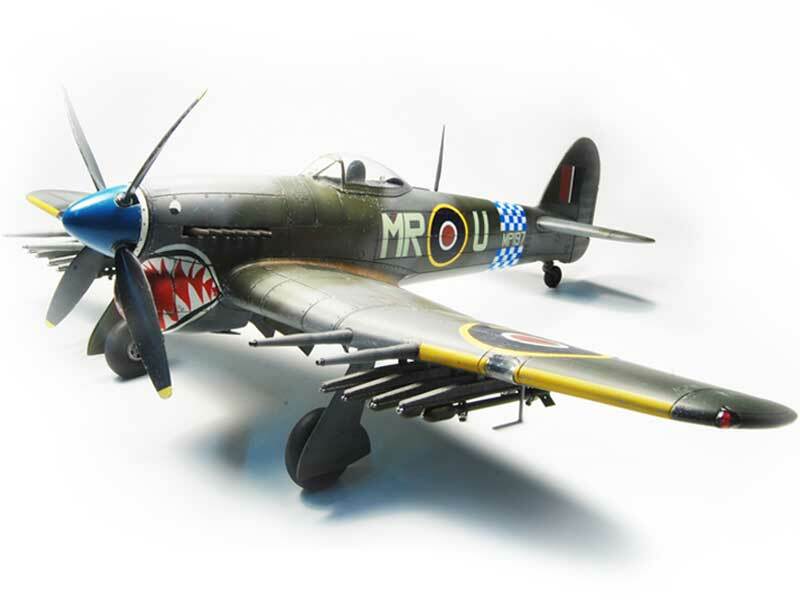 AMT-7 Greyish Blue: Nitrocellulose lacquer for lower surfaces of aircraft with combined fabric/wood and metal structures. Introduced starting 1943 as a substitute for AII Sv.gol. A-28m Greyish Blue: Oil-based enamel equivalent to color AMT-7, for inferior part of aircraft with metallic structure. With time this color acquired a yellow tint. MK-7 Matt White: Removable, water-soluble paint, for temporary or seasonal deployment, used for Winter camouflage during the entire war (1941-1945). Estuche de 8 colores Model Air de 17 ml. desarrollados para pintar los esquemas de camuflaje de aviones soviéticos y sus distintas combinaciones de colores, desde los años previos a la II GM (años 30’s) hasta la entrada en el conflicto de la URSS en Junio de 1.941 o “Gran Guerra Patriótica”. “Zashchitnyi” Khaki: Upper surfaces of airplanes with metallic finish or combined construction of wood and fabric. AII Zashchitnyi Camouflage Green: Nitrocellulose lacquer for upper surfaces of aircraft with a combined structure of wood and fabric, and eventually metal. Specifications issued in 1937 and used between 1938-1941. A-19f Grass Green: Alkyd treated enamel for upper surfaces of aircraft with a metal structure or metal parts in a combined structure of wood and metal. Specificactions issued June 1940. Grey-Blue: Lower surface color for airplanes t with a metallic finish or a combined wood and fabric structure during the 1927-37 decade. AII Sv.gol. (Svetlo goluboi) Light Blue: Nitro cellulose lacquer for the lower surfaces of aircraft with structures of combined wood and fabric, and eventually metal. Widely used in 1940 -1942 and gradually replaced by AMT-7. A-18f Light Blue: Alkyd treated enamel for lower surfaces of airplanes with metallic structures or metallic parts in a mixed metal and wood structure. Specifications issued in June 1940. AII Aluminiovyi: Nitrocellulose lacquer for overall finish or for lower surface on some models in 1938, as well as fabric surfaces of mixed structure aircraft. Specifications issued in 1938-1940. AEh-9 Light Grey: Alkyd treated enamel for general surface of aircraft with metal structures and metallic parts in mixed structures. Beginning 1941 used for interior structures. Specifications issued in 1937-1940.
necesarios para pintar los esquemas de camuflaje y una descripción detallada de los mismos. detallada de los mismos. Con la colaboración de “Pieza a Pieza Modelling Workshop”. aviones, donde se indican los colores necesarios para pintar los esquemas de camuflaje y una descripción detallada de los mismos. indican los colores necesarios para pintar los esquemas de camuflaje y una descripción detallada de los mismos. donde se indican los colores necesarios para pintar los esquemas de camuflaje y una descripción detallada de los mismos. patrones miméticos de los denominados “tácticos”, utilizados en Afganistán, Asia Central y Centro/Norte Europa. descripción detallada de los mismos. Estuche de 8 colores Model Air de 17 ml. desarrollados para pintar los esquemas de camuflaje de cualquier tipo de avión de la Luftwaffe previos a la II GM y Guerra Civil Española “Legión Cóndor”, así como las campañas o fases iniciales del conflicto: Polonia, Países Nórdicos, Batalla de Francia, Batalla de Inglaterra, etc. RLM 61: Standard upper surface camouflage color, combined with RLM 62/63. Pre-WWII and “Legión Cóndor“. Fighters, bombers, reconnaissance and transport aircraft, etc. RLM 62: Standard upper surface camouflage color, combined with RLM 61/63. Pre-WWII and “Legión Cóndor”. Fighters, bombers, reconnaissance and transport aircraft, etc. RLM 63: Standard upper surface camouflage color, combined with RLM 61/62. Pre-WWII and “Legión Cóndor”. Fighters, bombers, reconnaissance and transport aircraft, etc. RLM 65: Standard lower surface color, used on fighters until middle 1941, and all other aircraft (bombers, reconnaissance, transport and maritime, etc.) from 1938 to 1945. RLM 70: Standard camouflage color for upper surface, combined with RLM 71. Fighters from 1938 to beginning 1940, and other aircraft (bombers, reconnaissance, transport, etc.) from 1938 to 1945. RLM 71: Standard camouflage color for upper surface, combined with RLM 70. Fighters from 1938 to beginning of 1940, and other aircraft, (bombers, reconnaissance, transport, etc.) from 1938 until 1945. RLM 02: Color for interiors until middle 1941, and upper camouflage for fighters, combined with RLM 71 until 1941, and mottled camouflage until 1945. RLM 04: Color for tactical identification (fuselage stripes, wing tips, engine zone, etc.) and for lettering, numbers and insignia. From 1938 until 1945.